Canon 137 MICR Toner - MF211 MF212 MF216 MF217 MF226 MICR Toner Cartridge - 9435B001AA MICR - This Canon 137 MICR toner cartridge is a compatible Canon 137 MICR toner used for check printing. Print Color: Black MICR for printing checks. 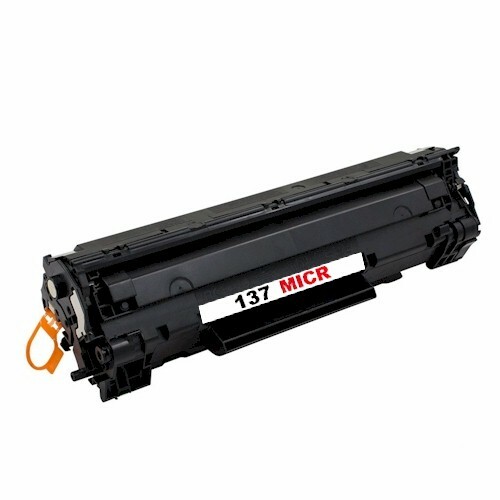 For use in Canon i-SENSYS LBP-151dw, MF211, MF212w, MF216n, MF217w, MF226dn, MF229dw, MF231, MF232w, MF237, MF244dw, MF247dw, MF249dw, Canon imageCLASS D570, LBP-151dw, MF211, MF212w, MF216n, MF217w, MF221, MF226dn, MF227dw, MF229dw, MF232w, MF236n, MF244dw, MF247dw, MF249dw, Canon Satera MF216n, MF222dw, MF224dw, MF226dn, MF229dw.